On our farm we raise both chickens for meat, and chickens for eggs. This means we often have to deal with roosters from the egg laying breeds and they are definitely not in the same class as the meat birds. As a result, I most often simply keep them whole and use them for chicken stew and such. Today I decided to try smoking a couple with different rubs to see how they turned out – here are the results. One of the challenges with these birds is that they are generally tough and do not have a great deal of meat. The smoker made a nice difference, cooking them low and slow and breaking the meat down to a much more tender consistency. I will likely brine next time to see how that affects them, and maybe try opening them up but that is for another day. For now, it is dinner time! This list will hopefully grow over time with your contributions and our finds! and propane grills to indirect smoke for years. 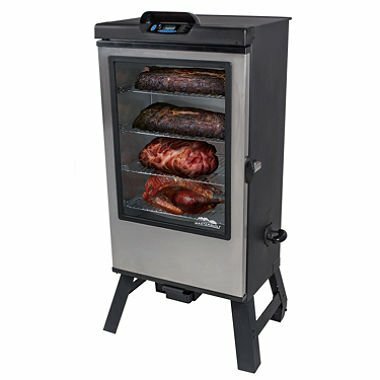 My idea with the electric smoker is to be able to gather data in a more controlled way, allowing for consistent reproduction of results and more accurate recipes to share here. I bought my model through Sams Club, and got a pretty good price but here is the same model on Amazon. Note that the smoker is considerably more buying from Amazon, but I am including the link for reference as to what it is. I will be putting up a page for links to smoker recipes now, and related information as I experiment more, and once I get a good handle on this model, I think I will likely adapt it for cold smoking as well using an old wine fridge I have. The first projects are just to understand the machine, but then the work begins in earnest. The challenge I am working on is managing boar taint smell in meat from an intact male pig. We butchered our large intact boar, and there is a strong odor when cooking as a result of hormones in the animal. There is no problem with eating the food, but the smell is off putting and hence I need to figure out a good way to prep and cook it. I will have more details on the successful ideas in a related post. Today I had the smoker running and decided to make some apple wood smoked eggs. They turned out well and I do love the flavor of the apple wood in the background. I got the smoker warmed up to around 200, then added the eggs. I had a pan of water in the smoker to keep the shells from drying out too much and set the temp for 225. I let the eggs cook for about 2 hours and then opened up the smoker to cool. I would have pulled the eggs at this point, but I had my grandson in my arm, so I did not want to mess with the smoker! Worth noting here, there are a lot of ways to smoke eggs, and many people hard boil first, or even peel them. This gives you different outcomes and require a bit more work in some cases. I simply put the eggs in raw, and let the hot smoking cook them. I do love Jowl Bacon – when ordering a pig, I highly recommend you specify some Jowl Bacon for yourself. I think the pairing of the bacon and spinach is about perfect and for this recipe, I added a bit of garlic and onion for the saute and then a bit of chicken broth to give it a little bit of soup to make a nice finish. Pan to cook in – I like a stir fry pan and lid but most any medium / large pan will do. Bag of spinach – cooking spinach is the most economical, but you can use most any type. Salt – kosher, coarse if you have it. An onion or so, depending on taste. A large sweet, or a regular cooking onion. Really it is about what you like. Fire & Water + Patience and a sharp knife and cutting board. Start with a stir fry pan if you have one, and if not, a large sauce pan that you can cover. Slice up a generous portion of the bacon into small pieces. Throw the bacon into the preheated pan and fry it up on medium heat while you dice up some onion and fresh garlic to taste. Once the bacon has reduced and is almost done, drain the grease into a jar for use later. Throw in the garlic and onion and stir it a bit while the onions caramelize a bit – this is also a good time to toss in a few pinches (or to taste) of coarse salt. I like Kosher or sea salt. Once the onions are caramelized and looking ready to eat, toss in as much spinach as you can fit into the pan. You can see from the photo I pile it high as it wilts down when you cook it. Cover and let it steam for a few on low heat. Toss in about 1/4 or so cup of water or chicken stock when you do this to help steam the spinach. Most of the liquid will cook off but it will also help flavor the spinach. I like to use a spoon or two of the dry chicken soup base here. As the spinach starts to cook down, start tossing it a bit to keep it cooking evenly. Once it is reduced as you see in the photos, plate (or bowl) it and enjoy! Green Shadow to the Rescue! So, maybe not a superhero move here, but our neighbors continue to be pretty superb folks. While doing chores, my bride and I were discussing how we can help our pigs and chickens that live outdoors get their feet dry with the incessant rain we have been having. Across the street from us, our neighbor owns Green Shadow tree service, so I walked over to ask Chuck about getting some of the wood chips from his piles to put in our pens. He stopped what he was doing, filled his truck and brought two loads to the front of our pens for me to load in with our tractor, without me asking him to do so. I brought a few more loads from his place with our tractor and the pigs were ecstatic, or at least I interpreted their crazy running around, rooting and jumping as such. This is another example of the type of people and friends we have around us, and reinforces how grateful we are to live where we do. People who jump to help each other, and who go beyond the need to make sure each other are ok are not common enough anymore. If anyone needs tree service done in the greater Bethlehem area, give Green Shadow a call – he has been in business for over 30 years and has a great reputation in the area. In our large common indoor pen, we built an access panel to accommodate access to future nesting boxes and we finally got around to building the nesting boxes this winter. For those of you who saw our post about the turkey nesting boxes and noted the 2×4 roost, this one is considerably smaller. That is due to the fact that chicken hens way a lot less and also have smaller feet, allowing the more size appropriate roost. The external access is great, and would make egg collecting chores easier, except we added other nesting boxes in the main pen for breed isolation during the spring egg season. Once we mix the hens again, this will be more helpful! Our turkeys got to laying stage and needed something besides finding piles of hay or straw to lay eggs in so we used up a variety of the scrap bits we had around to set up a 2 seater nesting box. The back is screwed into the barn structure, so there are only legs on the front. The front of the nesting box has a 2×4 step up rail to give the girls an easy way to get in and out of the nests and has worked quite well. all ready for turkeys when they are done in the dust bath! Now we are ready for eggs! We did note that we should have installed the back rail to keep eggs from rolling out the back when the hens got carried away, but that was an easy fix and we are now in business. A nice sloped roof that overhangs the nest by a few inches discourages pooping in the nest. Make sure you have the nests high enough to reach in comfortably without too much bending. The girls need a roost bar to get in more comfortably, but it is not required. 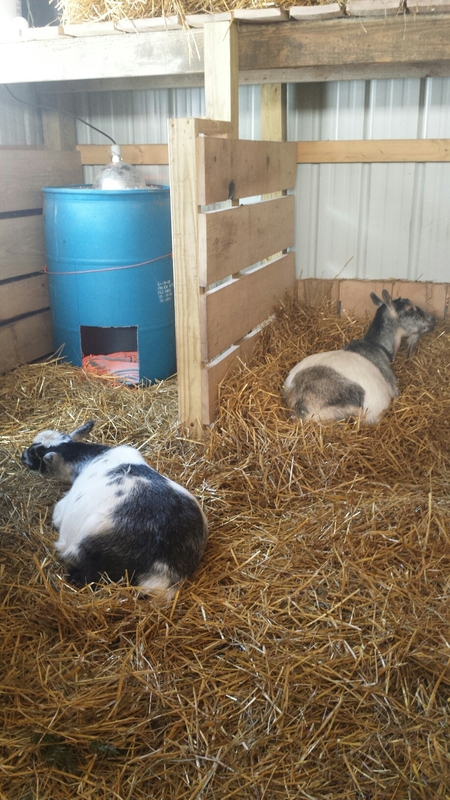 We know that our goats are pregnant thanks to the presence of a buck in their pen for the last six months. We had the vet out and he suggested that we save our money and not do the ultrasound test since we could see by the visibly growing bellies that they appeared pregnant. The Vet laughed and said that we could pretty well guarantee a happy kidding season in our future since we choose to pasture them together. So without knowing an exact due date we proceeded to prepare for kidding season. Jim built beautiful stalls within a larger pen inside the barn as a start. A place where we could house everyone away from the elements was very important to me. I picked out several lovely designs from Pinterest for him to see where I was gathering inspiration. Husbands love it when we do that don’t they? Pens, gates, and kidding stalls were what I was seeking ideas for. After that was completed a secondary pen was built using our 10 by 10 dog kennel panels on the far side of our barn. It worked out nicely that we could take down a previously used turkey pen and assemble the panels for the goats with a section saved for our roosters. This was done with shelters and large spools within the enclosure for our buck to be separated from the Mamas. He now lives there full-time with a doe we borrowed from another farm as company. It wouldn’t be fair to leave him out there all alone. The official “Kidding Kit” was put together and placed near the inside pen in a tupperware container to keep everything clean. There are plenty of clean towels, a trashbag and contents for the kit inside. We left the lubricant and Betadine in the house so they wouldn’t be overly cold when they were needed. Many books on goats – both dairy and meat goats were read. Each author adds details sharing how to prepare for the impending birth of your goat kids. They provide diagrams, photos and lists to help the novice learn. A few of my favorites are: Storey’s Guide to Raising Dairy Goats, The Meat Goat Handbook and also many websites for goat health. I reviewed our paperwork ensuring that all the does and buck have the appropriate certifications to make selling and showing the kids to be a smooth process. We had our American Goat Society certifications and paperwork in hand. Throughout the investigative process I realized that it would behoove us to seek dual certification through the American Dairy Goat Association. The reason for this was the number of shows on the East Coast that I found for non-members of ADGS were smaller. Nigerian Dwarf Goats are a great milking breed so shows to share that and attempt to win awards only betters our farm reputation. Identitfy genetics and pedigree of our animals. Now normally I would say that this is something you should consider prior to buying your animals. We did this backwards so Jim and I began a family tree to show the pedigree of our goats. There were many templates and information found using google, however Jim ended up using PowerPoint as he is comfortable with the program and it is free. Many of the Pedigree sites had a fee. Using ADGA was interesting as I could look up the relatives of the goats we own! Through the process and reaching out to the breeders of our goats, we found out that there are champions in the pedigree so hooray for us, we lucked out. Jim posted a great article about recipes for pork shoulder.. I decided to review one of the recipes posted. Below is our home -grown pork shoulder. The directions called for 8 hours of slow roasting at 250 degrees. I rubbed celtic salt and pepper all over the roast. I chose to use my turkey roasting pan with parchment paper on the rack. It was very nice to have the house smell like a delicious roast all day. The roast was removed after 7 hours in the oven. You tent the roast with foil while pre-heating the oven to 500 degrees. Put the meat back in the oven for 20 minutes or until the fat layer can get crispy. I was disappointed to see how much it shrunk! Something to take into consideration for the future. This roast fed 5 people, including our 19 year-old son. I think I will adjust our cut list to include larger roasts. This was juicy, melt in your mouth meat. It was served with cooked small multi-colored potatoes with butter and scallions on top. We also had a side of asparagus with fresh lemon on top. Great meal for a cold January night!